When it comes to writing for children, author, Lynn Kelley, knows how to turn on the magic. She twists the literary faucet and a stream of tummy-tickling words and kidlike situations gush forth. Her newest book, Curse of the Double Digits, is full of belly laughs. And though the book is written for early readers, grown-ups will gasp and chuckle as the main character, Becky, braves her way through turning 10-years-old—double digits. I’ve had the pleasure of knowing Lynn since we were scribbling our manuscripts with sidewalk chalk. Kidding. Though, we do go back to the turn of the century. Why does that sound so Victorian? Let’s try again. Lynn and I go way back before e-books and blogs became popular. Better. So much for memory lane, Lynn…now, let’s talk about your new chapter book, Curse of the Double Digits. Sidewalk-chalk sisters, I like that! As far as memory lane, well, you know how bad I am at directions and I get lost traveling down Memory Lane, too! Spill it sidewalk-chalk sister. Tell us how you hatched the idea for Double Digits? The idea that sparked the whole book was a real life incident. 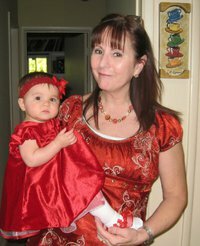 My niece was about six and her bangs were way too long to look presentable for a family event. My sister-in-law tried to trim them, but the scissors were too dull, so my brother had a light bulb moment and grabbed his electric razor. . .
Becky is the main character of your story, so do you think boys will be able to relate to Double Digits as much as girls? Many ten-year-old boys prefer books with a boy protagonist, but this is a humorous story, and I think boys will laugh as much as girls at the pickles Becky finds herself in. Plus, being embarrassed in front of the whole class is something boys and girls can relate to, along with all the other humiliating events Becky faces. Do you outline your stories or do you write by the seat of your bell-bottom pants? I only outline when I’m co-authoring the Monster Moon books, written under the pen name BBH McChiller. Otherwise, I write by the seat of my thread bare, tattered old pants. How long did Double Digits take for you to write? How many revisions? Would you believe it took a decade? I kid you not. I worked on it off and on for ten years. It’s been a fun journey and got better with each revision. I have no idea how many revisions. Far more than ten. When you’re writing for kids, how do you get yourself into a kids’ frame of mind? Does it come easy? What’s your process? I remember certain moments from my childhood quite well, how I felt and what I thought. Raising four kids also helped. Part of me is still a kid at heart and always will be. This is Alanna Heck’s debut as an illustrator. How did the two of you talented ladies team up? We’re both in the same writers critique group. Alanna is artistic, so I asked her if she’d be willing to give it a shot. She said sure. It was like the blind leading the blind since neither of us had ever worked with illustrations for a book before, but I think her drawings look great. You’re a hoot, Maria! I’m usually barefooted or wearing flip-flops while writing, so no worries about tangled shoe laces. As far as rituals, no, I don’t think so. Maybe making sure my glass of water isn’t empty. I’m always thirsty. Warning: Getting down to some serious author’s dirt here. As a kidster, your favorite Saturday morning cartoon? The Jetsons. Something about that futuristic world fascinated me. Flying cars, a house in the clouds with a conveyor belt for walking the dog, Astro, on the edge of thin air. A robot maid and all the gadgets and gizmos, like telephones with screens to see who you’re talking to, pills that turned into a whole meal. Lots of crazy, wacky stuff. Plus, it was funny. In Curse of the Double Digits, the main character Becky experiences a series of mortifying events which overshadow her upcoming 10th birthday party. Did anything similar happen to you as a kid? Nah, nothing like Becky has to deal with. I do remember I had a mole on my neck that I hated and was self-conscious about. It wasn’t that big, but in my mind it was as big as a mountain. I know that’s cliché. I must have whined about it a lot because for my 8thbirthday, my mom gave me a choice. I could either have a birthday party or get the mole cut off. We didn’t have enough money for both. I’d never had a birthday party before and that was a big deal, so I chose the party and lived with that ugly mole until I was 25. What kind of a kid were you at 10-years-old? Shy or class clown? Neither. I was Little Miss Teacher’s Pet, loved school, looked after my younger siblings, played outside, part tomboy. Kind of spunky. . . until junior high when I turned into the dorkiest of dorks and wished I’d had that ugly mole cut off for my 8thbirthday! Speaking of clowns, I understand you were a clown in another lifetime. I had always liked clowns and loved costumes and playing with makeup at Halloween, so while going to court reporting school, I tried to start a clown-magician business to make extra money. I wish I’d found some kind of clown class because I didn’t know what I was doing. Buffy (my clown name) didn’t earn enough to make it worth while. 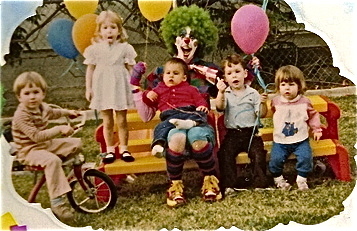 How sad, having to admit I failed as a clown. But nothing is a waste because Buffy the clown is part of Curse of the Double Digits! And learning the clown makeup paid off years later when my Funny Bones character was created for some of our writer’s events. You seem to have a natural, quirky sense of humor. Where does it come from? My dad is Mr. Funny Guy. He always told jokes, which I used to memorize and loved to tell. (These days I can’t remember the punch lines so I don’t tell many jokes.) My whole family is a bunch of jokers and pranksters. I hear you’re a fan of the Three Stooges? Which one’s your fave? Yes, I admit I’m fond of the Three Stooges, mainly because my brothers were always imitating them, which to me was even funnier than the real Stooges. I’d have to say Curly is my fave. Nyuk, nyuk, nyuk! Your grandfather was a professional magician. I mean, how cool is that? As a kid, how did this influence you? Did he teach you any amazing magic tricks you could share? (Hint, hint!) Did you ever think of following in his footsteps? Actually, he wasn’t a professional, but a very serious amateur who belonged to a club with other magicians. He never taught me any tricks. My family moved away from him and my grandmother when I was eight. He passed away when I was 14. I was sent to Pittsburgh for the summer to stay with my grandmother and help her prepare to move to California to live with us. During that time, she taught me some of his tricks, and gave them to me. When I had my kids, I taught them Grandad’s magic tricks. A couple of the tricks have survived through the years, like the snakes that pop out of a can of candy (the label is long gone), but the sword through the neck trick, I’m sad to say, bit the dust about 20 years ago. Darn, because that was such a good one! If you had a magic wand, what would you make disappear, appear, or reappear? Why? Oh my, what temptation. Like a genie in a bottle! Somehow I don’t think my magic wand could make all the problems of the world disappear, so allow me to be selfish, okay? I’d say, “Abbracadabra presto picheelo!” (Grandad’s magic words) and make Dr. Seuss’s Thing One and Thing Two appear to finish unpacking boxes from when we moved, hang the pics on the walls, and remove all the dust and dog hairs permanently. Permanently with a capital ‘P,’ please. Goofiest thing you ever did as a kid? I had a friend in Pittsburgh named Sheila Monahan. When I’d go to her house, she’d ask me if I wanted to eat some spinach. I always said yes, like it was a real thrill or something. I didn’t even like spinach (sorry Popeye), but this was different. We’d sneak upstairs to the pencil sharpener. Sheila would open the little drawer that caught the shavings, and we’d each eat some. I don’t know if I was six or seven, but in my mind, I knew it wasn’t spinach, even though she said it was. But it didn’t register that it was pencil shavings. I was gullible and trusting. Hey, I heard you once dragged your little sister along to set up a lemonade stand without your mom’s permission? Can you tell us about it, or is it still a sore subject with Mom? Did you get punished? No Brady Bunch? Care to name the rat who tattled? Actually, I didn’t think I was doing anything wrong at the time. Back in those days, kids were more free to roam the neighborhood. My sister usually went wherever I did. And it was Kool-Aid. Much easier to make. We set up business on a corner in front of a little store a couple blocks from our home in Shadyside. Pam was so cute and shy. Really adorable. I decided to use her as bait, so I hid in a niche a couple stores over. I peeked out, waiting for customers to come. Then I ran over to pour the Kool-Aid and collect the money. But there was hardly anyone around, so we packed up and walked from Shadyside, crossed the huge bridge that went over the railroad tracks, and didn’t stop till we reached a busy corner in East Liberty. We didn’t even see the guy, but police officers asked us if we saw a man running away. I said no, but offered them free drinks. What a kiss up! See, teacher’s pet syndrome? Mom flipped when I told her we were in East Liberty. She forbid me to go wandering off that far again. Ever have to march to the principal’s office? Stay after school? C’mon. You can tell us. Honestly, no. Little Miss Goody Goody me would have freaked to get in trouble! 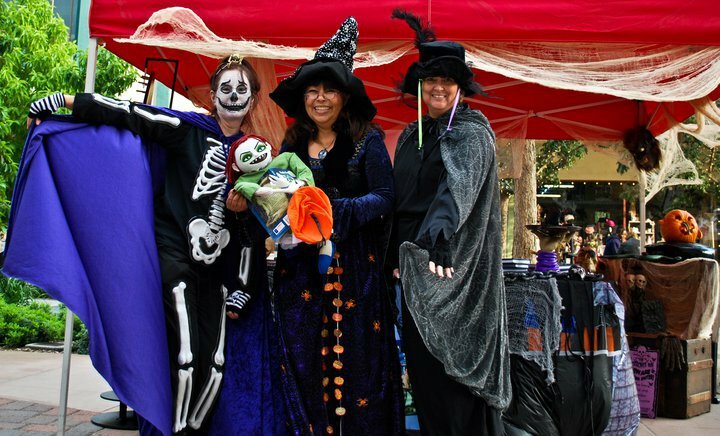 Like I mentioned above, Funny Bones was a character we invented to go with yours and Kathy’s witch getups, Batsy and Frizzelda. Funny Bones has a bag of bones, and each bone has a joke glued to it. I didn’t realize it until about a year ago that Funny Bones is actually a clown. So, ha, my clown dream is being fulfilled as Funny Bones! I didn’t plan it. It just happened. Definitely. Sweet fang is more like it when it comes to chocolate. You crack me up, Maria! I like to cut them up and put them on burritos, tostadas, and quesadillas. I don’t eat them by themselves. Are you loco? Haha! Seriously, though, I believe they’re one of the healthiest things we can eat and keep me from catching colds or the flu. No studies to back me up here, just my gut feeling! Oh, definitely you for sure. Two quirky women trumps just one any day. I’m not sure what I’d call it, but our reality show would feature our writers critique group. We’d be a hit, no doubt about it. Crazy writers who come up with some humdingers that I’m not going to repeat here. Nuff said. Funny you should ask. I have these two wonderful, wacky co-authors, Kathy Sant and Maria Cisneros Toth. We wrote the first two books in the fun, spooky Monster Moon mystery series (ages 8 – 12) under the pseudonym BBH McChiller (Stargazer Publishing). Curse at Zala Manor is the first book in the series, and Secret of Haunted Bog is the second title. I also authored a picture book, Merry as a Cricket (WhipperSnapper Books). So, tell us what’s next on the drawing board. Other works in progress? As you know, the next two books in the Monster Moon series are in the works. Once those are finished, I’m giving my full attention to a young adult book I’ve been working on for years. I’m itching to get back to it and finish it once and for all. I’ve also got ideas percolating for another chapter book or two. Best thing about being a children’s author? Have you ever thought of giving up the dream? Best thing about being a children’s author is children! They crack me up, lift my spirits just being around them. I enjoy doing author visits at schools. Hearing that a child loved reading my book is ultra rewarding. Yes, I’ve thought about giving up the dream. Usually when I’m in the middle of a meltdown over technical issues. But I know I’ll never stop because the ideas are endless and my muse would never let me rest! Do you have any advice for writers thinking about going the traditional or e-pub route? It’s a lot of work either way you go with many ups and downs. My advice is, don’t have high expectations of making tons of money. The chances of that happening are slim. Give it your all. There’s so much competition, so you need to polish your work as much as you’re able. Join a critique group where there’s good chemistry. You’ll learn so much from others and they’ll learn from you. Most important, enjoy the journey, and keep writing. How can readers and writers find you without having to use a GPS? Get your book? Thanks, Lynn! And super congrats on your awesome new book, Curse of the Double Digits! This entry was posted in Uncategorized on October 9, 2012 by mariacisnerostoth. Aw, thanks so much, Maria! This is soooooo cool! You’re welcome, Lynn! You were an easy target… um, I mean, you were an easy interview subject. Congrats on your book! It’s awesome and makes me laugh everytime I read it! Here’s to lots of young readers discovering “Curse of the Double Digits.” Cheers! You two are giving me the giggles. (And I need to giggle) BODACIOUS interview. Makes me want to jump up, race out the door, and head to my nearest store to buy this really cool book! Those humdingers sound really humdingy. Uh-huh. Maria, you rock woman! Lynn, you’re the coolest of the cool! Love you both!!! Hi Robyn, glad you dropped on by! Hope you remembered to grab your purse on the way out the door to the store. Can you pick up some chocolate minis while you’re there, too? LOL! Thanks for the compliment! Lynn is a cool cat. We shared lots of laughs as we worked on the Monster Moon mystery series with Kathy, and there are always plenty of giggles at critique. Somewhere in between all of the silliness we get some work done. We’re tough critique chicks, you know? And lately, we’ve enjoyed hearing your writing at critique, too. Take care! You did a splendid job with the interview. And I’m so glad Lynn’s book is now available. Thanks, Steve! 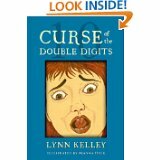 And I agree, so exciting that Lynn’s book, “Curse of the Double Digits” can now be enjoyed by readers! Thank you, Steve. You’ve been so supportive and helpful, and I’ll never forget it. Take care! Hey, Maria, good job on the interview. I learned a lot of interesting things about Lynn that I didn’t know, like the fact our talented friend wrote a picture book as well. I laughed reading this interview and look forward to reading the book which I purchased just recently. Brilliant job, both of you! Aw, I’m so glad this interview made you laugh, Yvette! I’m so excited that you’re going to read my book! Hope it makes you laugh, too! Thanks, Yvette! Love the interview! Maria, you’re a pro at it. Lynn, I also can’t remember any punchlines now…it’s so sad. LOL! It was so much fun to learn more about you and your very funny life! Hi Teresa, thanks for popping on over! It would be a blast to hang out together! Oh, the trouble we could get into. LOL! Thanks for stopping by to read the review, Teresa. We would LOVE to hang out with you. We’d all have a great time. Talk to you soon. Great interview, great conversation! Nice to find out more about Lynn the human rather than just Lynn the author. Congratulations! How in the world did I miss your comment, Melissa? I tell ya, I don’t know how some authors have huge launch parties and keep up with it all! I’m going back and forth to different sites trying to keep up. The FaceBook party is getting wild and crazy, so they’re keeping me on my toes! Haha! Thanks so much, Melissa! You rock! CURSE OF THE DOUBLE DIGITS was ten years in the making. Becky is turning ten. It’s October 10. Whoa, I’ve got chills. Congrats, Lynn. Thanks for a fun interview, Maria. Thank you, Pat! So cool to see you here. Thank you for celebrating with us! Congrats again Lynn! You are such an amazing author! Woo hoo, Nychaelle, you have three entries in the contest, three shots at winning that paperback! Thank you for stopping by to celebrate some more! Party! Hi Alarna! How wonderful to see you here, too! I really appreciate you taking time to celebrate with me today. I know you’re dealing with tough times right now. Thank you for buying the book! I’m excited for you to read it. Thanks for the wishes of good luck! Need lots of that in this business, in addition to writing well! Take care! Maria, thanks again for featuring me here. Your interview added a super yummy layer of frosting on Becky’s birthday cake! Great interview! I know a lot more about you now, Lynn! LOL! Thank you, Writingcoach! I’m so glad you stopped by to read the interview! Good luck with the givea-away.